From Paris a rural drive incorporating a few villages, a château and a good lunch is a delightful way to spend a Sunday in early summer. Or any time of year for that matter. Our friends Lynne and Brian were visiting from Australia and staying with us at the Embassy complex. We booked a table for lunch at La Vanne Rouge in Montigny-sur-Loing, about an hour’s drive from Paris. After a pleasant drive via the Château de Fontainebleau we arrived in the small village of Montigny-sur-Loing. Lynne, Brian and I went to find the restaurant while Matthew parked the car. The restaurant appeared to be set up for summer in the courtyard, accessed through high timber double gates. There didn’t appear to be any other way in. The gates were locked so I rang the bell and we waited. After a few minutes I rang again. No response. Through the keyhole I could just make out a few tables, but I couldn’t see any staff in order to draw their attention. We had been waiting for more than 10 minutes when Matthew arrived to find me jumping up and down in an effort to be seen by someone inside. I rang the bell again, this time long and hard. Suddenly the gate was opened by a tiny elderly lady dressed in black, her hair pulled back into a severe bun. Madame looked us over and demanded to know what we wanted. I explained that we had booked a table for one o’clock and apologised for being 15 minutes late, adding by way of explanation that we had been waiting for more than 10 minutes and had rung the bell several times. “That’s impossible. There’s no need to tell lies” she barked back at me. Then in the same cross tone she shouted across the courtyard to a young waiter “Did you take a booking for these people at one?” Fortunately he confirmed that he had. We were getting pretty hungry by this stage and finding somewhere to have a good Sunday lunch in France without a booking is virtually impossible. We know, we’ve tried. “Follow me” said our unfriendly hostess. And so we did, feeling like four naughty school children. “Sit here” she said, pointing to a table with nothing on it. Madame proceeded to set the table, plonking everything down noisily and glaring at us all the time. “Is this normal?” whispered Lynne, as we sat in silence like stunned rabbits while Madame finished the table. “Um not really, but it does seem to happen more in France than in Australia” I replied when Madame was out of earshot. The meal arrived and it was excellent. 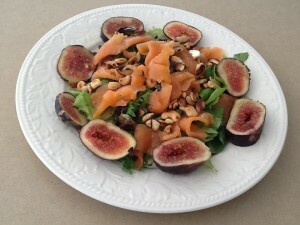 My starter of figs with smoked salmon was so delicious I have been making my own version ever since. Whoever would have thought that figs go so beautifully with smoked salmon? Their chef had made the smoked salmon into a nest in the middle and cut some of the figs into small dice to scatter around the plate. And their salad leaves were very small delicate mesclun, so it all looked very snazzy. My version as you can see is far less glamorous, but not bad for a quick lunch. Once the food arrived we relaxed and started to enjoy ourselves. As we were eating, Madame’s three-legged dog appeared and I made a fuss of him. That was it, her attitude changed completely and we were friends for life. Dress salad leaves with a little oil and vinegar then arrange on two plates. Arrange smoked salmon and figs over the salad, sprinkle with the toasted pine nuts and drizzle with a little more walnut oil. Note: Having made a whole heap of pesto last weekend I had run out of pine nuts so I used chopped cashews which were okay but not quite as good. If you haven’t got walnut oil use olive oil. 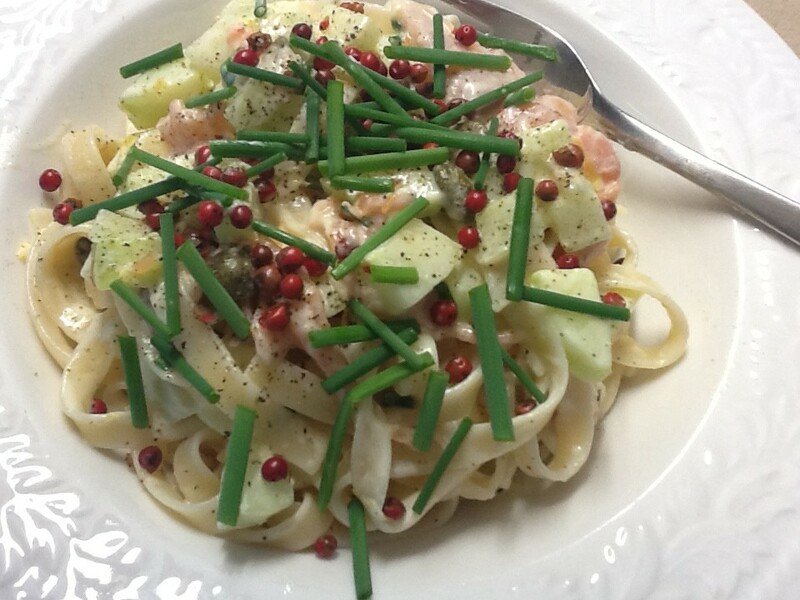 This entry was posted in Recipes and tagged easy, family, lunch, quick, salad, salmon, summer by Linda Peek. Bookmark the permalink. ¡¡ Super ! la receta, y también la historia !!. 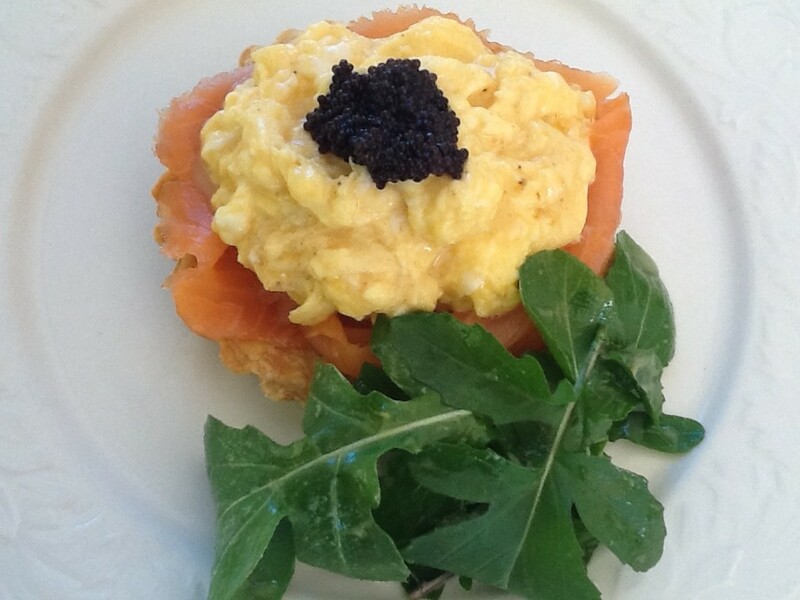 Another wonderful recipe and story”. It was like being there :-). Lindita, you should write a whole book with these stories ! Haven’t made the dish yet cuz no figs in Stgo., but sounds delicious. I made this dish Friday night at home, really great. Was even better when we had dinner at a friend´s house Saturday night and she served it as a starter. She has a fig tree in her garden!